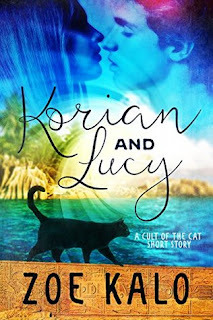 NOTE TO READERS: "Korian and Lucy" is NOT a novel. It is a companion short story (6,000 words) to 'Daughter of the Sun' (Cult of the Cat Book 1). It is meant to be read AFTER 'Daughter of the Sun,' otherwise you won't get the full meaning or references to characters. 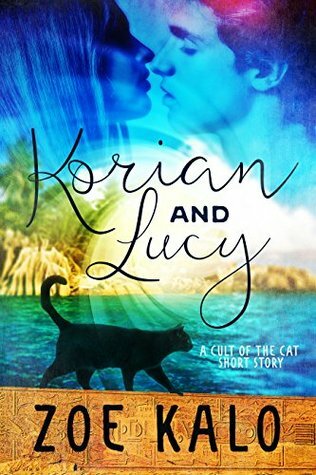 It is the love story of Korian and Lucy (Trinity's parents) and takes place in The Island of Cats 17 years before the birth of Trinity. I picked this book for 2 reasons. One - it is a short story and two - It is a companion story of 'Daughter of the Sun' which I read and reviewed earlier. Here is my review of the book 'Daughter and Sun' and I loved it. This is a love story of Korian and Lucy who are Trinity's parents. The title of the book and cover are very apt. I loved the characterization. Lucy both as a teenager who falls in love and also as a responsible daughter stays in your heart and Korian as a charmer and carefree guy is portrayed well. Lucy's relationship with her mother and Korian is very realistic. The major drawback is that you cannot understand this story without reading 'Daughter of the Sun'. Another minus is that this story is in-complete. The love story itself which is the main theme is not complete. We can expect the other mysteries about the Trinity's aunt and Trinity's mother's research to be covered in the next part of the book, but at least this short story might have covered the complete story of Korian and Lucy. Other than these short comings, this is a wonderful romantic read. ps:I have received a book from the author in exchange of an honest review and this is my unbiased opinion on the book. A daughter of adventurous expats, she’s had the good fortune of living on 3 continents, learning 4 languages, and experiencing a multicultural life. Currently, she’s working on a Master’s degree in Comparative Literature, which she balances between writing, taking care of her clowder of cats, and searching for the perfect bottle of pinot noir.